This week I'll be posting some of my "home schooling essentials", a couple of the items that I can't live without when teaching the kids at home, as part of the Schoolhouse Review Crew's winter blog hop: 5 Days of Homeschooling Essentials. The items in my posts this week may seem very simple and some even silly and, yes, they are simple items. Home schooling, like life, is as simple or complicated as we choose to make it and I prefer to keep it simple. 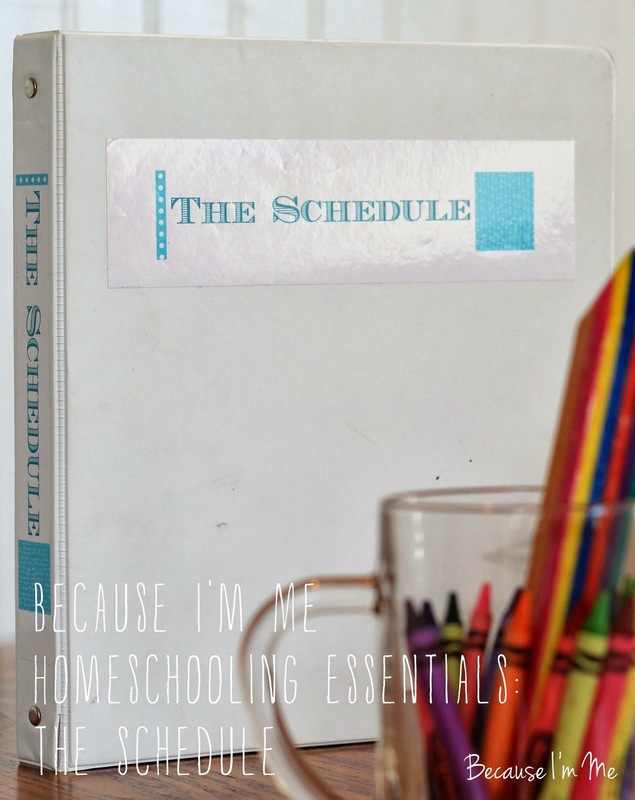 I know no magic secrets or products that make home schooling successful, but after many years of teaching at home I have found a few things that make my world flow well and I'm excited to share them to you. I keep two home school schedules - an annual one, listing my goals per child for the year, and a weekly one, listing what each child must do each week. These schedules are organized in my 1" binder, which is then kept in my bucket. At the beginning of the year I sit down with The Well-Trained Mind and previous years schedules and write an annual plan. This plan gives me general parameters of what we will accomplish over the school year. The annual schedule's used to be kept taped to a wall, but are now kept in a separate section of the weekly schedule binder so they're easy to look at, allowing me to see if we're staying on track or what I have planned to do next when we finish a book. The annual schedule stays similar from child to child ... what Cassie did as a seventh grader is similar to what Adam is going this year. 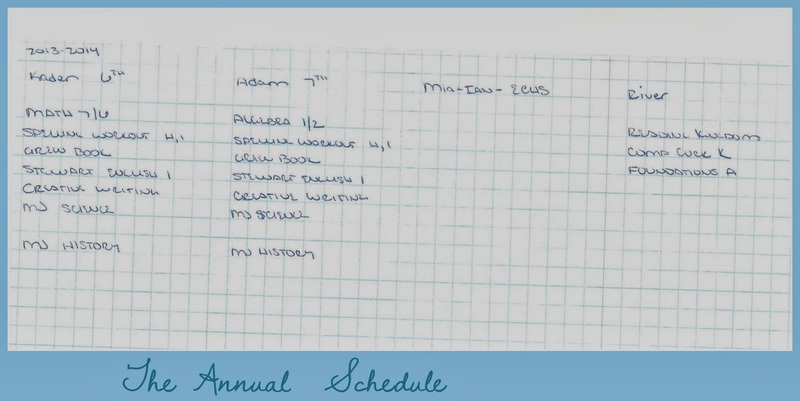 Having her schedule, and Ian's and Mia's, to refer to helps to keep the annual schedule writing pretty simple, and allows me to double check and be sure I'm not forgetting something I did with them that worked well. After writing the annual schedule I can then proceed to write a weekly schedule. Right now the weekly schedule is just for Adam and Kaden. River works closely with me, so I know what's he done. I don't believe he should have to do schoolwork at his age (not yet Kindergarten) so I work at his pace and keep it fun for him, and when he doesn't want to do school he doesn't have to. Back to the schedule ... I started doing the schedule this way pre-divorce when both parents were teaching and needed to be on the same page, and wrote about it here. It allowed us both to quickly know what needed to be done and what had been done, and we could both easily work from the same schedule page. Cassie worked very independently and, when given her schedule, would just barrel through it and have plenty of free time. Mia worked this way as well, but the boys prefer to be given a day at a time, not an entire week, so with them I go day by day. The schedule lists exactly what they need to do in a given week. If I've checked everything off at the end of the week then I know they're done. Like our other binders, the schedules are organized with the newest on top. I take this binder to our annual review, to show what we've been working on. The schedule is not set in stone. I can add or subtract from it as needed. My goal is to get everything we set out to do done by the end of the year, and as long as we're on track to accomplish that then I don't sweat it when day-to-day issues come up that throw us off track. Allowing for give and take is part of the reason I don't write the schedule more than one week at a time. If you have any questions about anything I mention this week feel free to ask. 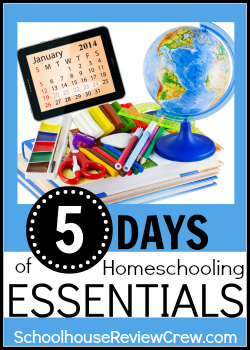 For even more terrific blog posts in the 5 Days of Home Schooling Essentials series click the image in the top left corner.